Although many longer-term vapers move to rebuildable dripping atomizers or tank atomizers over time, there is an undeniable benefit to the simplicity of sub ohm tanks. The pre-built coils that come with devices like the Uwell Crown, the Smok TFV8 and many others perform excellently and are easy to install and use. The only downside is that picking up replacement coils can get expensive very quickly, often costing $2.50 per coil or more. While this isn’t very much per coil, over a year or more of vaping the costs can really mount up. However, there is a solution: rebuilding stock coil heads yourself. This might seem like a lot of work, but it’s really easier than you think, and the same basic approach works for a wide range of stock coils. If you’re willing to get your hands dirty – figuratively speaking, apart from a drop or two of e-juice – you can get better performance, save a ton of money and never be stuck without a coil to vape with. So here’s a look at rebuilding stock coils for sub ohm tanks and other devices, including the benefits to doing it, how to do it in general and a specific application of the method to the Uwell Crown, still one of the most popular tanks on the market. First Things First: Why Would You Rebuild Your Coil Heads? Before we get onto the details of how to rebuild your coils, you may still be wondering what the point is. There are four key reasons you might want to start rebuilding stock coils, although the main benefits are encapsulated by the first two. Saving Money: Pre-built coils are expensive. In comparison, a huge spool of kanthal, stainless steel, nickel or titanium is cheap and cotton is even cheaper. For the price of one five-pack of pre-built coils you’ll be able to keep vaping for most of the year. Tweaking Your Performance: Stock coils tend to perform pretty well, but when you make your own coils, you can ensure that the performance suits your Not only can you tailor the resistance to suit your habits, you can use different build styles or wire types to further personalize your performance. Never Being Without a Coil: If you run out of stock coils and can’t rebuild, you’re stuck with nothing to vape. If this happens to somebody who rebuilds coils, or who can rebuild coils, he or she can breathe life back into the atomizer head after half an hour or so of tinkering. An Additional Hobby: Vaping is a replacement for smoking, but the more techy aspects make it a great hobby too. Rebuilding stock coils can give you something enjoyable to tinker with – like model-building or creating a Minecraft palace – with the added benefit of being able to vape it when you’re done. Is Rebuilding Stock Coils Difficult? One concern you may have is that rebuilding a stock coil will be too difficult for you. This is understandable – after all, there aren’t many electronic devices you’d feel comfortable cracking open and modifying – but thankfully your apprehension may be misplaced. It’s actually disarmingly simple to rebuild stock coil heads. If you’ve used an RDA before you’ll be right at home after a little introduction to how pre-built coils work. For vapers with no experience of rebuilding, building new coils for stock atomizer heads is a bit more difficult than rebuilding an RDA. Since RDAs are pretty cheap, we’d recommend picking one up if you’re interested in rebuilding, but it is entirely possible to jump right into rebuilding stock coil heads if that’s more convenient for you. The learning curve will be a little steeper than with an RDA, though. How Do Stock Coil Heads Work? Before we go over the process for rebuilding a stock coil, it’s important to get to grips with how stock coils work and what exactly you’re doing. If you haven’t read our post on getting to grips with RDAs and aren’t familiar with them, this may be a good time to take a look, but it’s not essential. Stock coil heads ultimately work in a very similar way to RDAs. The two “legs” on the coil are connected up to a positive and a negative contact point on the atomizer head. These are threaded with or surrounded by wick so it can soak up juice and keep you vaping. The big difference is the nature of the positive and negative contact points. 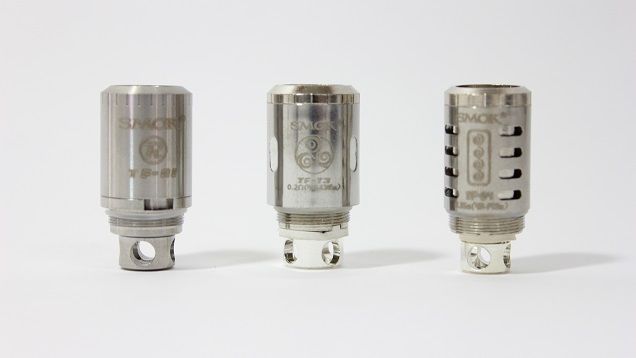 Whereas RDAs have big, towering posts which you connect your coil up to, the connections on stock atomizer heads are located at the base of the housing. The main tube is hollow, and has a large chamber for the coil itself to sit in. 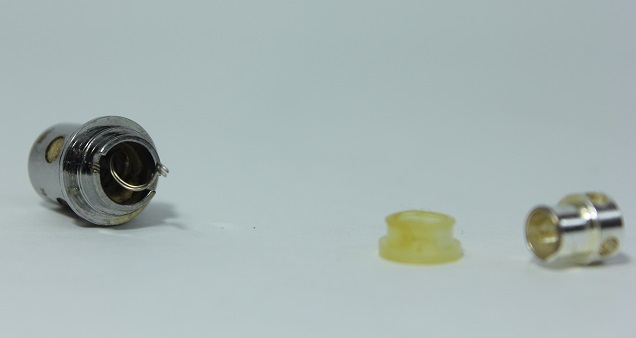 The two legs of the coil point directly down towards the bottom of the atomizer head, and are trapped by a rubber grommet and a metallic pin. There are usually small sections cut out on two points at the bottom of the coil head to make room for the wire-ends. The method below will make this more clear, but once you understand the basic structure of pre-built coils, you can see why rebuilding them isn’t as scary as it looks. So now you have a basic idea of how pre-built coils are put together and why you might want to start rebuilding them, we can get down to business. This method won’t work for every tank, admittedly, but the general layout is usually similar enough that you’ll either be able to directly apply it or just make a few small changes to suit your device. To rebuild stock coil heads, you need pretty much anything you need for any coil build. If you’re an RDA or RTA user already, you’ll have everything you need. If not, you may have to place an order for some supplies, but what you pick up will last you quite some time. Kanthal/SS/nickel/titanium resistance wire: Coils are made from resistance wire. For wattage/voltage mode vaping most people use kanthal, but you may wish to try stainless steel, nickel or titanium if you’re building for a TC-equipped device. Nickel is tough to work with, though, so kanthal or stainless steel is better if you’re quite new to building. Anything from 24 to 28 AWG is good, with lower numbers producing lower resistance coils. Japanese organic cotton: Japanese organic cotton is very much the standard in the industry these days, and while most types of cotton are suitable for RDA builds, you will need a sheet of Japanese organic cotton to get the best performance from a stock coil rebuild. A building “guide”: Find a drill bit, a precision screwdriver or anything thin and tube-shaped to build your coil around. You may have to think about your specific device here – you need something thin enough so your coil will comfortably fit inside the housing. Pliers, tweezers or ideally both: Pliers or tweezers are needed to take the atomizer head apart and to properly align the leads with the contact points on the coil housing. Pliers are also particularly useful because building for stock coil heads requires you put a sharp kink in one of the legs of your coil. Wire cutters/scissors/nail clippers: To snip the legs of your coil down to size, you’ll need something sharp and metal. The main concern here is something that allows you to cut really close to the side of the atomizer head. Nail clippers are pretty good at this, but many wire cutters work well for precision cutting too. An old atomizer head: How else would you rebuild one? The first step is taking your old atomizer head apart. This might seem daunting on it’s own, but it’s pretty simple once you know what you’re doing. At the bottom of almost all atomizer heads – at least the ones we checked out researching for this post – is the setup described earlier: a metal pin going into a rubber grommet, going into the base of the coil. If you look around the inside edge of the pin, you should be able to see a tiny end of wire sticking out somewhere. Between the grommet and the base of the atomizer you should see another one. If you find them in different places (although this hasn’t happened to me personally), you’ll have to connect your coil-legs up to the same spots you found them in. Pull out the metal pin, using pliers or using the tip of a screwdriver or whatever you need to. Then pull out the grommet, ready for the possibility that the coil comes out with it. If the coil stays in place, you’ll need to grip one of the legs – either with your fingers, pliers or tweezers – and pull it out. Wrap the old coil up in a bit of tissue and dispose of it. At this point you’ve essentially disassembled the atomizer. However, most atomizers these days have a layer separating the inner chamber from the wicking ports. This is usually a thin layer, separated from the rest by a metallic cover, which has a sheet of Japanese organic cotton inside it. This is the wick that directly soaks up your e-juice, and the wick surrounding your coil soaks up juice from this. On some devices (like the Uwell Crown we’ll cover in more detail later), you can separate the outer casing from this layer. If you can, not only can you change the outer wick, it should also make the rebuilding process a bit more forgiving by giving you better access to the chamber. If you can’t, we’d suggest just giving the outer wick a rinse with some warm water and letting it dry before you vape. When it comes to wrapping your coil, for the most part there are no differences between wrapping an RDA coil and one for a stock atomizer head. There are only two extra things you have to keep in mind: ensuring your coil will fit in the atomizer head without touching the sides, and bending the legs of the coil down so they both point downwards to the bottom of the atomizer head. Look at the size of your atomizer head and determine how big you should make your coil. I tend to use a precision screwdriver to give me an idea: stick the screwdriver in the spot for the coil, make a note of the length you have to work with and check to see the width of the screwdriver leaves you enough space between your coil and the walls of the atomizer head. Once you have a good idea of what size coil you’re aiming for, you can start to wrap it. If you’re really skilled (or want to go through an extra step) you can make it a contact coil, so each successive wrap touches the last one. For most purposes, though, an ordinary coil will perform great anyway. Keep the spacing of each wrap as even as you can, and neaten it up after you’re done if you notice a major issue. Finish your coil with the legs on opposite sides. The coil in most atomizer heads stands vertically with wick wrapped around it, rather than horizontally with the wick threaded through it. If you hold your coil vertically now, you should have two legs pointing off horizontally in different directions. At this point, if you want to make a contact coil, you need to compress the coil you’ve just wrapped. If you’ve been able to make the coil so the wraps are already making contact, you may be able to get them all pressed together without the addition of heat. However, if there are big gaps, you’ll need to either connect the coil up to an RDA or use a lighter to heat the coil while you compress it with the help of some tweezers. This is described in more detail in a separate post. The next step is to get some pliers (or even tweezers) and create two bends in the legs so they both point directly downwards. The upper leg is the biggest concern here, because it has to go right down the length of the coil without making contact with it. However, you have to keep it as close to the coil as possible so your whole setup doesn’t take up too much horizontal space and make contact with the side of the atomizer head. Check the width of your coil head to see how much room you have to work with. When you’ve done this, the coil-wrapping process is complete. Wicking your coil is the next step. To do this, take a sheet of Japanese organic cotton and place it next to your coil. Cut a strip from it that’s wide enough to cover the length of your coil. As for length, just keep the whole length of the sheet for now. Remove the front and back layers of the cotton so you have two fluffier faces for wicking. Now place the end of the cotton strip between the upper leg and the coil. Wrap the rest of the cotton around so the coil is completely encased in wick. How thickly you coat the coil depends on how much space you have in your atomizer head. You want it to fit snugly, but not so much that it’s hard to get the wick-and-coil back in the atomizer head. Unfortunately this may require a bit of trial and error, but you’ll get the hang of it eventually. When you’ve reached the end of your wick-wrapping, you can snip any excess off. If you wet the tip of the wick with a little bit of e-juice, you can use this like glue to get the wrap of wick to stay in place. Now you should have a coil encased in wick, with two metal legs poking out of the bottom. The final stage is getting your creation into the atomizer head. This is easier said than done, but it essentially requires you to push the coil and wick up into the atomizer head without damaging or deforming it along the way. The best advice here is to keep your building guide inserted through the center of your coil for stability, and then give the atomizer head a little twist as you insert the coil. If you twist it in the same direction as you wrapped your cotton you won’t unravel it in the process. Try to position the coil in the center of the chamber, avoiding any protruding bits of metal, mesh covering the top of the atomizer head, or anything else that could cause a short. Most atomizer heads have little blocks cut out of the bottom for the legs of your coil, so make sure your legs line up with them. When you’ve oriented your coil, remove your guide from the center. Now insert the rubber grommet, threading one of the legs through the center and trapping the other one between it and the metallic edge of the atomizer head. Bending this off to the side helps you push the grommet snugly into place. Note that one leg is trapped between the grommet and the atomizer head, and the other runs through the middle. The next step is inserting the metal pin into the grommet, trapping the other leg between the two as you do. Again, bend this off to the side to help push everything down snugly. Should I have rinsed or replaced that gross outer wick? Probably. Finally, you can snip the legs so they’re as flush to the body of the atomizer head as possible. This is really important, because having too much wire leftover can easily lead to connection issues. Cut the wire as short as you can – you can do the first before you insert the metal pin if you struggle to get up close to it. Nail clippers can get you a really close cut, but if you have some wire cutters that let you get up close to the atomizer head they’re just as good. Now you’ve re-assembled your atomizer head with a new coil, you’re almost good to go. However, we’d recommend attaching your coil to the base of your tank and testing the resistance before you go priming the coil and filling up the tank. If you have a 510-threaded ohm reader, attach it and take a reading. If you don’t, you can just use a regulated mod, most of which automatically read your coil’s resistance. Not only does doing this ensure your resistance is in a reasonable range, you should keep an eye out for fluctuating readings. If your resistance jumps around a little, you’ve probably got a short somewhere and need to sort it out. If the readings are in the range you’re looking for and they’re stable, then you’re safe to prime your coil, assemble your tank and fill up. The Crown is one of the most popular sub ohm tanks on the market. Thankfully, you can pretty much use the general method described above for the stock coils. They’re put together just as described above, and the chamber is fairly spacious. You can also take off the outer cover to make the process a lot easier. This goes just as described above: remove the pin and grommet from the bottom and pull the coil out. I had a lot of extra sheets of cotton stuck up in mine, so I removed them with a pair of tweezers. There’s also an extra step you can take with the Crown that makes things a bit easier, but isn’t strictly needed. Look closely and you’ll notice an inner shell and an outer shell, with a sheet of cotton between them. The inner shell has two slots cut out on opposite sides to ensure juice makes it’s way to your coil. As Law Vapes demonstrates, you can remove this to get better access to the atomizer head’s interior. The outer shell (left) and the inner section (right) can be separated. Position a screwdriver tip on the bottom edge of the big vertical slot and knock the inner section free. He places a screwdriver through the two slots and their nearby wicking holes, then puts the tip of another screwdriver right on the bottom edge of the slot. Tap the end of the second screwdriver with a hammer and the two pieces should separate. I went for this approach, but as described above, you can rebuild the coil with no problems even if you leave the outer casing in place. There’s quite a lot of room in the Crown, so I’ve opted for a slightly wider-diameter coil than I’d usually go for. The atomizer head isn’t too short either, so you don’t really need to worry about your coil not fitting in place vertically. In this example, I’ve made it a parallel dual coil. This is really easy to do: cut two pieces of resistance wire and hold them side by side. Then wrap a coil as you usually would, but with both strands. All you have to do is take care to make sure they don’t cross over during the wrapping process. This again works just as described above. The main thing to consider is how wide the atomizer head is, and for the Crown this is pretty wide. Cut a strip of wick about as wide as the length of your coil, and you should be able to wrap pretty much the whole length of it around your coil and still get it into the atomizer head. It makes things neater if you snip off the very end, though, and use a bit of juice on the edge to glue it all down. Get the end in between your coil and the longer leg and then start wrapping. The final stage is getting your coil where you need it to be. After pushing the coil into place with a little twist – or just threading the legs through the opening in the bottom if you’ve removed the outer shell – you line the legs up with the two cut-out sections of the atomizer head. Then insert the rubber grommet, threading one leg through the center and trapping the other off to the side. You can snip this leg now if you like. Finally, insert the metal pin into the bottom of the atomizer head, trapping the second leg between it and the grommet. If you've removed the outer shell, you'll have to wrap the inner section in a new piece of cotton before replacing the outer shell. Push the shell back on, snip everything down as smoothly as you can and you’re good to go. Screw your coil into the base of the Crown and test the resistance to ensure it’s in the right range and you’re getting consistent readings. Then prime the coil, fill up your tank and get ready to vape. Although we’ve only covered two basic coil builds here, it is possible to get more ambitious coil builds into your old atomizer heads. For example, picking up some Clapton wire and building a regular coil with it is an easy way to improve your performance without making the building process too technical. Some people don’t want to rebuild their atomizer heads, and that’s completely understandable. If you love building, there are many RDAs and RTAs where you can tinker in a more building-friendly environment and probably get better results. However, if you like the convenience of your favorite sub ohm tank but the cost of coils is just getting too much for you, learning to rebuild your own coils can save you tons of money. Vaping is cheap anyway, but you can make it even cheaper.